For thousands of years, the massive glaciers of Earth's polar regions have remained relatively stable, the ice locked into mountainous shapes that ebbed in warmer months but gained back their bulk in winter. In recent decades, however, warmer temperatures have started rapidly thawing these frozen giants. It's becoming more common for sheets of ice, one kilometer tall, to shift, crack and tumble into the sea, splitting from their mother glaciers in an explosive process known as calving. "Ice coverage is one of the most sensitive indicators of climate change," he says. About half of the loss of ice from the polar ice sheets is occurring due to melting and half due to iceberg calving. While it's more straightforward to estimate iceberg melt rates, their calving rates are much harder to pin down. For the 2012 film "Chasing Ice," videographers endured subzero temperatures and years of patience to record stunning time-lapse footage of ancient glaciers receding. Their efforts also yielded the largest calving event ever captured on film. The area involved was about the size of Manhattan. The filmmakers described it as like watching skyscrapers rolling around in an earthquake and an entire city breaking apart before their eyes. Direct field observations of calving icebergs are as dangerous as they are rare. So Burton and his colleagues developed ways to model these events in a controlled, laboratory setting. "We can measure things that can't be measured in the field," he explains, "and it's also way cheaper and safer." He and his colleagues built a cylindrical, Plexiglas water tank as a scaled-down version of a fjord, similar to the ice-walled channel at the end of the Ilulissat glacier, which drains the Greenland ice sheet into the ocean. This well-studied glacier, also known as Jakobshavn, is considered an important bellwether for climate change. While it is normal for glaciers to both accumulate and shed ice, Jakobshavn provides a vivid snapshot of how the shedding process has speeded up. The glacier retreated 8 miles during the 100-year period between 1902 and 2001, but has retreated more than 10 miles during the past decade. Greenland's ice sheet appears to be out of balance, losing more ice than it gains. Burton's lab creates experimental models to gain a more precise understanding of these glacial processes. Rectangular plastic blocks that have the same density as icebergs are tipped in the water tank and the resulting hydrodynamics are recorded. One hypothesis that the lab is investigating is how the waves unleashed by capsizing icebergs may be causing earthquakes that can be detected thousands of miles away. "It's counterintuitive," Burton says, "because usually you think of earthquakes as causing large waves and not the other way around." 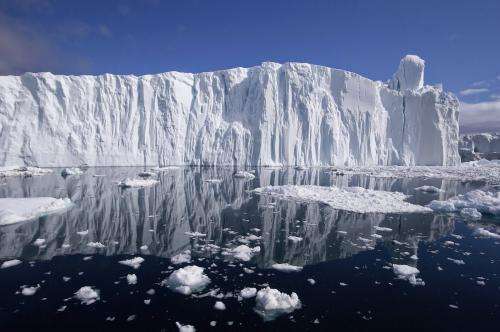 The lab models, however, suggest that the violent rotation of massive icebergs generates waves that release the brunt of their energy onto the sheer vertical face of the glacier, instead of dispersing most of it into the ocean. "If we can correlate the frequencies of earthquake signals with the frequencies of icebergs rocking back and forth in the water, then that could be a direct measurement of the size of the icebergs that have broken off," Burton explains. "Large iceberg calving events could then be detected and measured using remote seismic monitoring." Climate change and its impacts is one of the top problems in science, Burton says. "We're seeing huge changes occurring within a few years and we've got to get on it. I'd like to think that, a few decades from now, we were able to do something." Real progressives don't condemn their own kids based on 32 years of science's "could be" a climate crisis and real progressives don't threaten their own children with the exaggerated greenhouse gas ovens of their exaggerated CO2 crisis just as an excuse to hissy fit hate neocons. Now who's the neocon? *Canada killed Y2Kyoto 2 years ago with a freely elected climate change denying prime minister and nobody cared, especially the millions of scientists warning us of unstoppable warming (a comet hit). 32 more years of "could" be the end of days is unsustainble in "belief". Deny that. The AGW Cult is truly desperate, as their shameless deception gets worse. The world has actually cooled since the 1930s.